Human induced pluripotent stem cells and male infertility:an overview of current progress and perspectives. Recently, significant progress has been made in ART for the treatment of male infertility. However, current ART has failed to help infertile patients with non-obstructive azoospermia, unless donor sperm is used. In fact, most couples wish to have their own genetically related child. Human induced pluripotent stem cells (hiPSCs) can be generated from patients’ somatic cells and in vitro derivation of functional germ cells from patient-specific iPSCs may provide new therapeutic strategies for infertile couples. The overall developmental dynamics of human primordial germ cells are similar to that in mice, but accumulating evidence suggests that there are crucial differences between human and mouse PGC specification. Unlike mouse iPSCs (miPSCs) in the naive state, hiPSCs exhibit primed pluripotency which possess less potential for the germ cell fate. Based on research in mice, male germ cells at different stages have been derived from hiPSCs with different protocols, including spontaneous differentiation, overexpression of germ cell regulators, the addition of cytokines, co-culture with gonadal cells in vitro and xeno-transplantation. 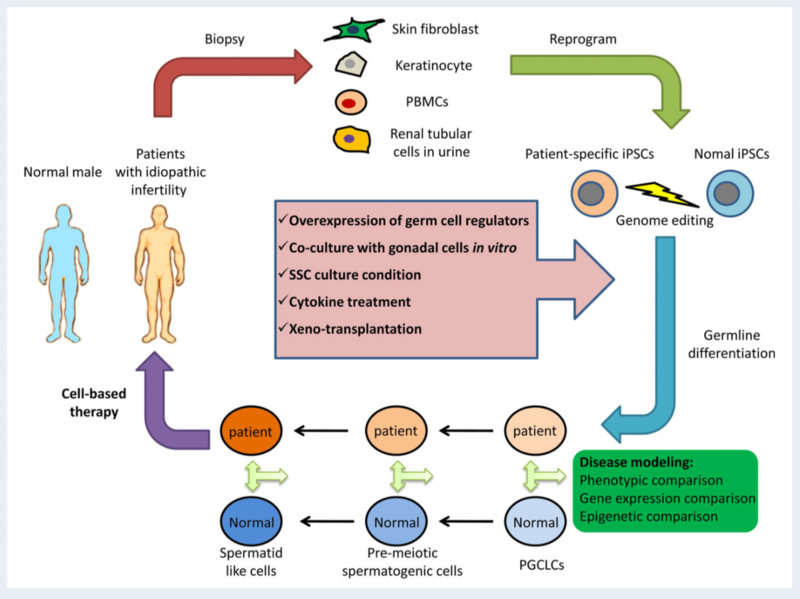 The aim of this review is to summarize the current advances in the derivation of male germ cells from hiPSCs and raise the perspectives of hiPSCs in medical application for male infertility, as well as in basic research for male germ cell development.